The 1955–56 European Cup was the first season of the European Cup, UEFA's premier club football tournament. The tournament was won by Real Madrid, who defeated Reims 4–3 in the final at Parc des Princes, Paris, on 13 June 1956. The participating clubs in the first five seasons of the European Cup were selected by French football magazine L'Equipe on the basis that they were representative and prestigious clubs in Europe. Of the originally selected teams, Chelsea of England were barred from participation by The Football Association, who saw the tournament as a distraction to domestic football. Chelsea were replaced by Gwardia Warszawa of Poland. In addition, Holland Sport, Honvéd and BK Copenhagen rejected the opportunity to represent the Netherlands, Hungary and Denmark respectively, being replaced by PSV Eindhoven, Vörös Lobogó and AGF Aarhus. 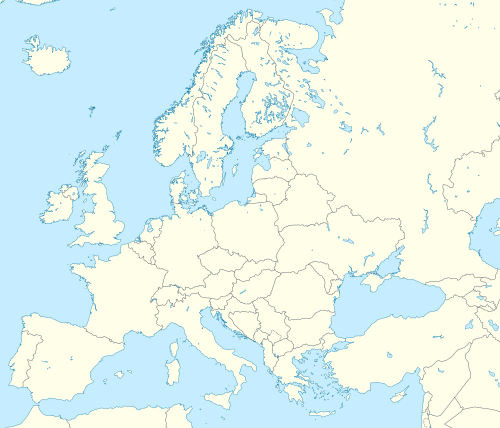 This was also the only UEFA tournament to include a representative of Saarland, unified into West Germany in 1957. The first round pairings were fixed by the organisers and not drawn as would be the case for all future European Cup matches. Location of teams in the 1955–56 European Cup. Real Madrid won 7–0 on aggregate. Partizan won 8–5 on aggregate. Hibernian won 5–1 on aggregate. Djurgården won 4–1 on aggregate. Vörös Lobogó won 10–4 on aggregate. Reims won 4–2 on aggregate. Rapid Wien won 6–2 on aggregate. Milan won 7–5 on aggregate. Hibernian won 4–1 on aggregate. Reims won 8–6 on aggregate. Milan won 8–3 on aggregate. Reims won 3–0 on aggregate. Real Madrid won 5–4 on aggregate. "50 years of the European Cup" (PDF). UEFA. October 2004. Retrieved 17 July 2008.